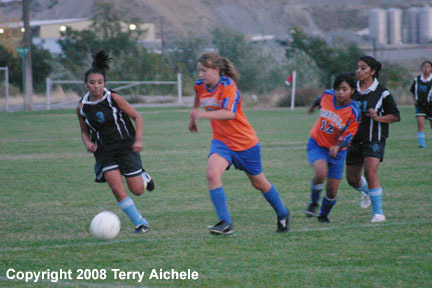 One of the Umatilla junior varsity soccer players works her way through Riverside defenders. 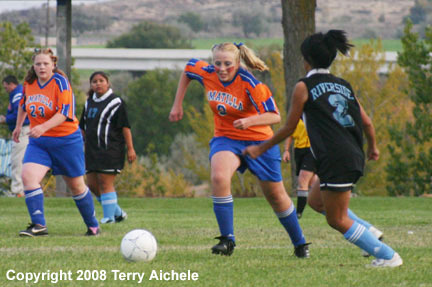 UMATILLA - The Umatilla girls jv team hosted Riverside jvs in soccer action on Thursday afternoon. The varsity game was played earlier in the afternoon. Riverside won that one 4-1. It was a blustery, chilly afternoon with some of the crowd huddling under blankets. Others were dressed more for the ski slopes than a soccer match. Just a few days earlier the temperatures were in the 80's at this time of day. Thursday they were in the 40's. Umatilla was the first team to score at about the 23rd minute of the first first half when number 18 hit from about 5 meters from the top of the penalty box to give the Vikings a 1-0 lead. Riverside missed a penalty kick in the 27th minute. Riverside was successful in the 36th minute with a shot from the right side of the goal box. This tied it up 1-1. That ended up being the score at the end of the first half. The teams were scoreless in the second half until the 17th minute. That's when Umatilla scored on a penalty kick by number 2. That gave Umatilla the 2-1. At the 33rd minute of the second half the referees discussed the darkness issue with the coaches and announced that they would only play for two more minutes. The darkness made it tough to pass, shoot and set up plays. Neither team was able to score in the darkness. 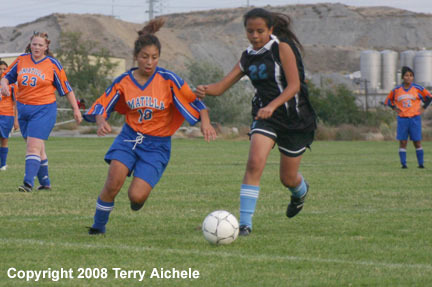 LEFT - Umatilla jv number 18 brings the ball into the Riverside zone. 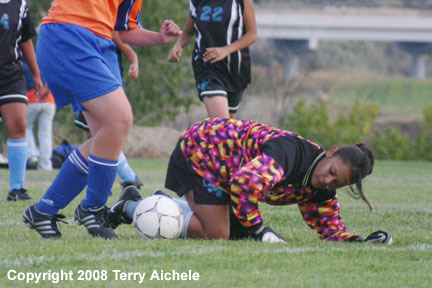 RIGHT - The Riverside goalie uses her body to block the shot by a Umatilla forward. 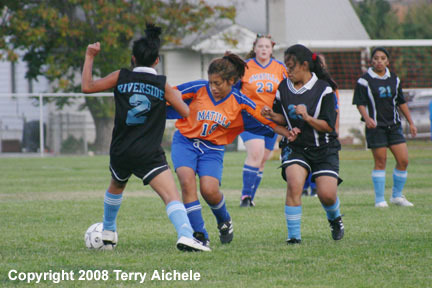 LEFT - Riverside number 2 steals the ball from Umatilla number 18. 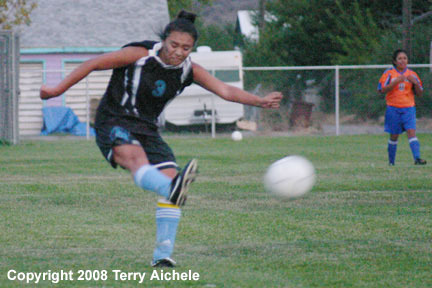 RIGHT - Umatilla number 9 takes a shot on goal. 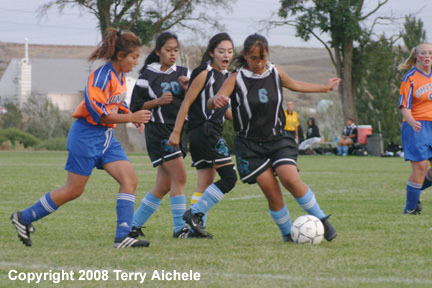 LEFT - Umatilla number 8 battles Riverside 22 while bringing the ball into the Riverside zone. 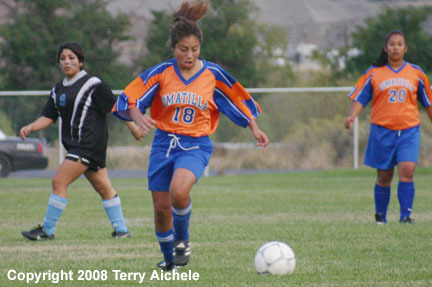 RIGHT - Umatilla number 18 brings the ball into the Riverside zone. LEFT - Riverside number 6 backed up by teammates controls the ball. 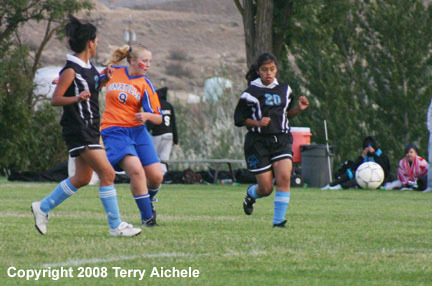 RIGHT - Umatilla number 9 and Riverside number 2 race to an free ball. LEFT - Riverside number 3 takes a shot on goal. 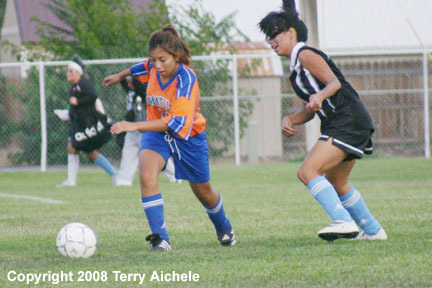 RIGHT - A Umatilla player takes the ball away from a Riverside player. 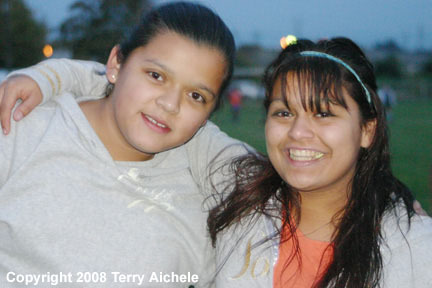 LEFT - A couple of soccer fans wanted their picture taken. It was getting darker by the moment. RIGHT - This photo is an example of how fast it was getting dark. While looking at the lcd screen of the camera just a few minutes after taking the photo on the left. 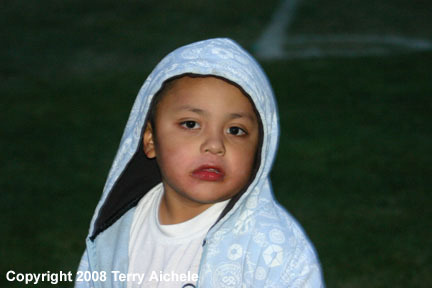 I was checking to see if the pictures were even visible when this little boy came up and was interested in the pictures.